South of Mexico City, the Popocatepetl volcano sent a column of ash into the sky, capping a period of seismic activity including two powerful tremors this month that have killed more than 400 people and caused damages of up to $8 billion (£5.9 billion). Although the latest quake was not as destructive, fear is running high among the population. Terrified residents crouched and prayed when the alarms went off and two women died of heart attacks as the ground shook, the city government said. Concern that the quake could cause further collapses paralysed rescue efforts at a housing complex in the Tlalpan neighbourhood of Mexico City, frustrating first responders who earlier believed people were alive under the rubble. By the evening, hard-hatted first responders were again digging for bodies or survivors. Elsewhere, the work barely skipped a beat when earthquake alarms twice rang out across the streets of the city. The United States Geological Survey said the latest quake was relatively shallow with an epicentre near Juchitan, a tropical region of Oaxaca state hard hit by a massive 8.1 magnitude tremor that struck on Sept. 7. The Popocatepetl volcano, which is visible on a clear day to the approximately 20 million people that live in the Mexico City metropolitan region, spewed vapour and ash-filled gas after two small eruptions on Saturday. Dozens of buildings were brought to the ground by Tuesday’s earthquake and an army of trained rescuers and scores of volunteers have been frantically removing rubble in a day-and-night search for survivors. Officials said there could be some 30,000 badly damaged homes in the adjacent states of Morelos and Puebla. RMS, a risk modelling company, estimated economic losses of $4 billion to $8 billion. After several days of searching, Mexican volunteers, professionals and soldiers backed by teams from countries as far away as Japan have saved 60 people from the rubble. But in the past 48 hours rescuers have found more corpses than survivors, and frustration was mounting. The government has run a massive search and rescue operation involving thousands of soldiers and police, but in outlying areas of the city and surrounding villages, victims complained that help has been slow to arrive. “Here we have no help, everything is the centre (of the city),” said Justina Gonzalez, 55, a shopkeeper in the Xochimilco district in the far south of the city whose two-bedroom house fell down on Tuesday. She now lives in a tent. “We lost everything, we don’t even have a way to cook,” Gonzalez said, adding that neighbours were bringing her family food. Caravans of volunteers were shuttling aid to isolated communities, with many from brigades organised at Mexico City universities. Others came from other parts of Mexico to help with the efforts. Eleazar Hernandez, 42, who sells candy in the rural state of Michoacan, said he helped clear rubble and then staffed a makeshift kitchen to feed people who lost their homes. “It’s the people, not the government, that are donating things,” Hernandez said. Tuesday’s quake hit on the anniversary of the deadly 1985 tremor that by some estimates killed 10,000 people. A government response panned as lacking at the time severely damaged the credibility of the ruling Institutional Revolutionary Party. 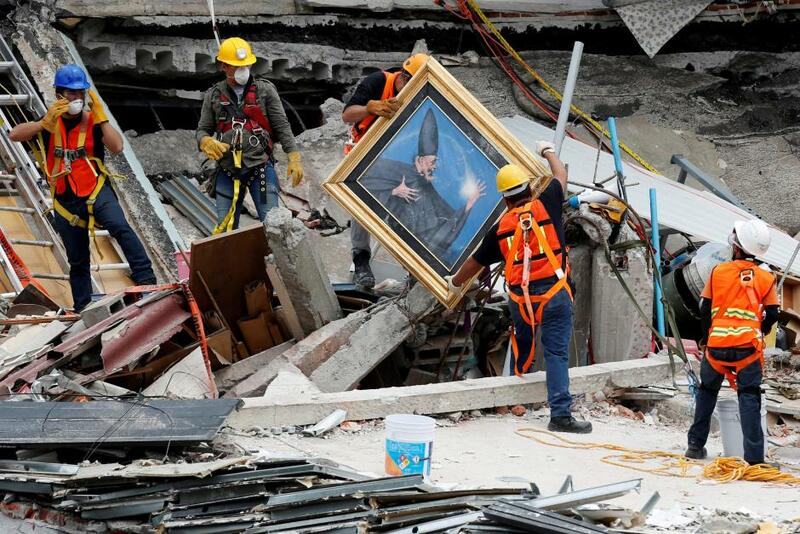 Mexico is now better prepared to deal with the aftermath of earthquakes, helped by disaster planning, civic groups, a stringent building code and communication technology.